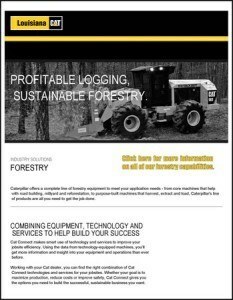 Whether you need a harvester, feller buncher or forestry machine, Caterpillar forestry products provide unprecedented stability and agility. From large to small, Cat machines are designed with the type of weight distribution and balance that allows them to move in, around and over rough terrain with ease. Yet, Cat machines are known for their meager appetite. You’ll burn less fuel and get more power, thanks to Caterpillar’s advances in engine technology and machine design. Cat electronically controlled ACERT engines deliver exceptional power and fuel efficiency that is unmatched in the industry. Designed for high performance in all forestry applications, they also meet all current U.S. EPA emission standards — ensuring the safety of their “jungle” environment. Cat noise reduction technologies let you work quieter in the woods, too. Depending upon the model, Cat engineers have utilized everything from rubber-isolating engine mounts and on-demand cooling fans to engine and powertrain refinements to reduce operating noise. Torque, traction and agility only go so far in a forestry application. Fortunately, Cat machines are equally adept at flexing their hydraulic muscle when the real work begins. No matter the machine or the model, Cat hydraulics provide the power and control needed for a variety of applications. A quality machine will only take you so far in Louisiana’s “jungles,” pine plantations and woodlots. Fortunately, Louisiana Cat not only offers the best forestry equipment in the business, but stands behind it with reliable and unrivaled dealer support, factory trained technicians and fully equipped facilities. For more information on Louisiana Cat’s forestry capabilities click here or contact us.